It actually wasn't that bad of day today. I let go of worrying about the future and all that was or was not going to happen and just trusted. I trusted that somehow it is all going to work out. One thing I have found is that working with tarot is that it really keeps me grounded din the present. The card a day stays with me and I focus on what I need to do today. 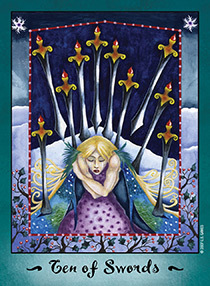 Tarot does help keep me grounded and it is a reminder that there is a world outside of my little world. Going to the cemetery reminds me of the same thing as sometimes I get so caught up on what is happening in my world at this very moment that I forget that there is a great big world out there where what's going on in my world really doesn't matter. The one thing about myself that I'm starting to realize is that there are times that I exhibit signs of Borderline Personality Disorder. I find myself feeling empty even when life is going really well and I get overly attached to people. I also find myself concerned about what other people are thinking about me and feeling as if I may be stabbed in the back. A lot of this is making it all about me and that is not healthy to me.